What a healthy khichadi with jowar, sounds delicious. Haven't try khichadi with jowar, will give it a try on some time . Looking forward to your whole grain series !! Another lovely way to use jowar and this sure is a healthy and yummy kichadi!! I always use jowar in dosa. This is such a great way to incorporate jowar. Yummy and comforting kichadi there. Give me that plate, feel like finishing it rite now. What a healthy and hearty Khichdi Harini. That is a nice healthy kichdi and it looks awesome. I am yet to find the cracked variety here. I would definitely be making this for my daughter as soon as I find it..
Hearty, healthy and wholesome meal to sum up this dish. This Khichdi looks awesome Harini, you guys have done an excellent job by picking up 4 themes and all alternating that we have ended up reading on whole grains through the month right..very healthy pick! This khichdi looks really delicious and its so healthy. I will have to look for some jowar to prepare this. Looking forward to your other whole grain recipes. This is such a hearty and nutritious khichdi with jowar rawa. I have to make sure to bring at least 2 packs of this back from India. 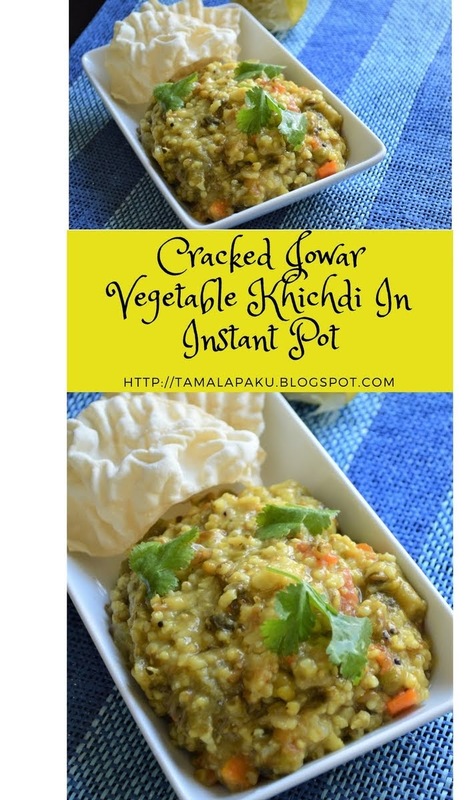 Wow, such a healthy and delicious Khicidi there harini, a wonderful way to make use of Jowar..
Let me find the cracked jowar to try this delicious khichdi. Sounds healthy and tasty one pot meal. What a wonderful use of jowar. One more grain that I have not experimented with. The kichadi looks so creamy and perfectly cooked! Khichdi with Jower is really healthy.. love your variation. The whole platter looks delicious Harini. I have whole jowar and maybe I should pulse it in a mixie and try this dish. Definitely a healthy one! That looks and sounds delicious harini! Such a healthy and a filling meal! Love how you guys use the IP and bring up so many quick and healthy dishes!!! Jower Khichdi is really healthy but can you please tell me it is good for diabetic persons?